kept in filth or kept clean, a cage is still a cage. the tiger into her new surroundings. As they watched, she went to a corner of her new area and immediately started to pace in a small area. She continued this activity until the day she died many years later. 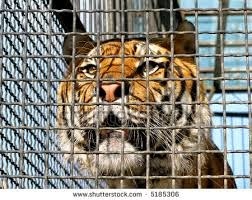 Like the tiger, we often put limitations on ourselves. There is some comfort in not venturing beyond our comfort zone. We feel safe there. We feel content there. Could we expand our horizons? Of course we could, but what if we dared and failed? How could we possibly handle that? Take a look at your life and find one area where you are so safe and secure that you couldn't imagine doing anything bigger. Next, think of one way you could expand in that area and take the step to do it. Venturing out of your comfort zone seems frightening. But imagine the rush when you take the first step and succeed.